Lunge Fish are large, bucktoothed catfish that try to eat Yoshis whole in the Yoshi franchise. Their English name is a pun on the type of fish known as the "lung fish". Lunge Fish first appear in Super Mario World 2: Yoshi's Island, where they hide in the water, and, like their name implies, will lunge at Yoshi as he passes by. Occasionally, a Lunge Fish will stick its head out of the water. Yoshi can then throw an egg at the fish to momentarily stun the creature, or he can defeat one outright by spitting an enemy out at it. If Yoshi falls in the water, a Lunge Fish will attempt to swallow Yoshi and Baby Mario whole similar to how a Boss Bass does. In Tetris Attack, a Lunge Fish appears as a playable character and an opponent who is paired with Flopsy Fish. In this game, it is depicted as a slight friend of Yoshi's, enchanted by Bowser and Kamek to work for them. 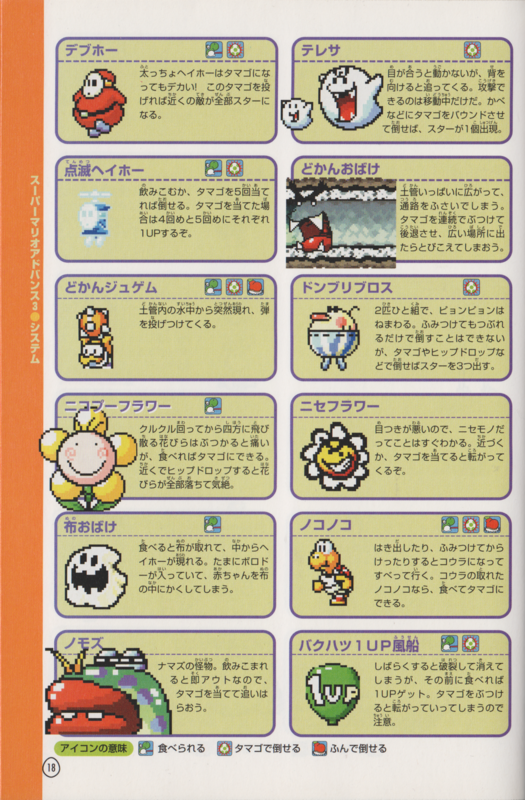 It also notes that it really doesn't like Yoshis much, since Yoshis give it indigestion. It replaces Neris, the sea fairy from Panel de Pon. In Yoshi's Island DS, Lunge Fish appear again, with their sprites appearing to be the desaturated Yoshi's Island: Super Mario Advance 3 ones with added shading. They act exactly the same. In one level, Yoshi must travel in a boat over a lake infested with Lunge Fish. In Yoshi's New Island, they prominently appear in the level Lose the Lunge Fish. From this game onwards, their lunging-while-inhaling behavior is replaced with a Boss Bass-esque leaping, showing off their entire bodies. However, they still function in the same pattern as before, sinking below the water before rising up and forwards in a jerky arc. Lunge Fish appear in Yoshi's Woolly World as an enemy in some stages with water. 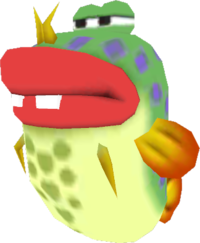 In this game, Lunge Fish are modeled on coin purses, with their lips being made of coin purse clasps. Yoshi can defeat them with Yarn Balls or watermelon seeds, earning a handful of beads, but they will respawn quickly. They act as they do in Yoshi's New Island, but are larger and move through the air slower. They only appear in Rollin' Down the River and Wonderful World of Wool. Lunge Fish reappear as enemies in Yoshi's Crafted World during the level Ride the River, where they sit in place in the background, jumping out whenever Yoshi crosses their line of sight, and can take down platforms while trying to eat him. At the end of the level, one instead pursues Yoshi horizontally, taking down several moving platforms while repetitively leaping. Near the end of the level's flip side, two can be seen looking back and forth instead of in a single direction, and as such can leap in multiple directions. In volume 14 of the Super Mario-Kun a Lunge Fish is depicted as being able to use electricity on its enemies, based on the real-life electric catfish. Mario sees a Winged Cloud that gives out a blue watermelon. Mario makes Yoshi eat it, which then freezes the Lunge Fish. Nomozu From namazu, meaning catfish. This page was last edited on April 15, 2019, at 18:14.